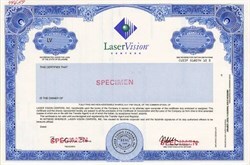 Beautiful specimen certificate from Laser Vision Centers, Inc. This historic document was printed by the Security - Columbian Company and has an ornate border around it with a vignette of the company name and logo. This item has the printed signatures of the Company’s Chairman of the Board and Chief Executive Officer, and Treasurer. Laser Vision Centers, Inc. provides access to excimer lasers, microkeratomes, other equipment, and value added support services to eye surgeons for the treatment of nearsightedness, farsightedness, astigmatism, and cataracts. The company provides a range of value-added services to the eye surgeons using its equipment. These services include initial training of physicians and staff, technical support and equipment maintenance, marketing, clinical advisory service, patient financing, partnership opportunities, and practice satelliting. 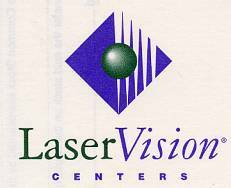 As of May 15, 2002, Laser Vision Centers, Inc. operates as a subsidiary of TLC Vision Corp.